Experience: Lanvin Captoe Felt and Grenade Leather Sneakers. The Watchlifestylers' Choice. Lanvin is the oldest French 'haute couture' house and was founded in 1889 by Madame Jeanne Lanvin as a hat boutique. Working out of her small apartment located at 22 Rue de Faubourg-St. Honoré in Paris, Jeanne started making such beautiful clothes for her daughter Marie-Blanche de Polignac that in 1908 she decided to branch out and launched a children's apparel line. In 1909, Lanvin joined the 'Chambre Syndicale de la Haute Couture' which marked her formal status as a 'couturièr' and started making dresses for the Parisian female elite. By the late 1920s and in celebration of her daughter's 30th birthday, Jeanne launched the perfume 'Arpège' which quickly became a huge success. At the same time, Jeanne introduced her new logo —Jeanne as a mother dressed in a flowing evening dress holding her daughter's hand— on the bottle of 'Arpège'. This is the same logo that today is an icon and synonym of one of the most exclusive 'haute couture' houses in the world. In 1994, L'Oreal purchased the company and seven years later sold it to Shaw-Lan Wang, a Chinese media magnate. It was not until 2010 when Lanvin opened a boutique on Madison Avenue and a year later three boutiques in Moscow. The Lanvin Captoe sneakers are not only the most iconic luxury sneakers in the market but also a sneaker that is extremely popular among celebrities and watchlifestylers. The Lanvin Captoe sneaker comes in a variety of types of leather, finishes, captoes and combinations. The most popular model to date is the one featuring suede with a patent leather captoe. The Lanvin Captoe sneaker ref. AM5DBB1LANP7B is the newest model in the low sneaker captoe line. Featuring navy blue felt and a black grenade grain leather captoe, this is a shoe that will make an impression wherever you go wearing them, just like the Audemars Piguet Royal Oak Offshore Diver in our pictures. 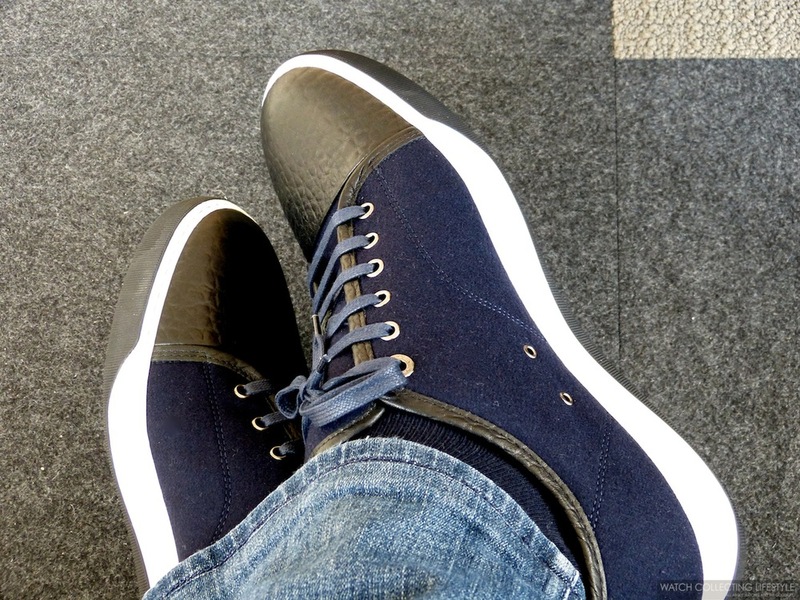 The shoes are not only perfectly designed but also very well crafted and extremely comfortable. The shoes feature leather piping along the ankle area, by the shoe lace grommets and on the back of the heel. These shoes are fully lined with dark brown leather and their interior is very soft and features extra cushion on the heel tab and the shoe tongue. 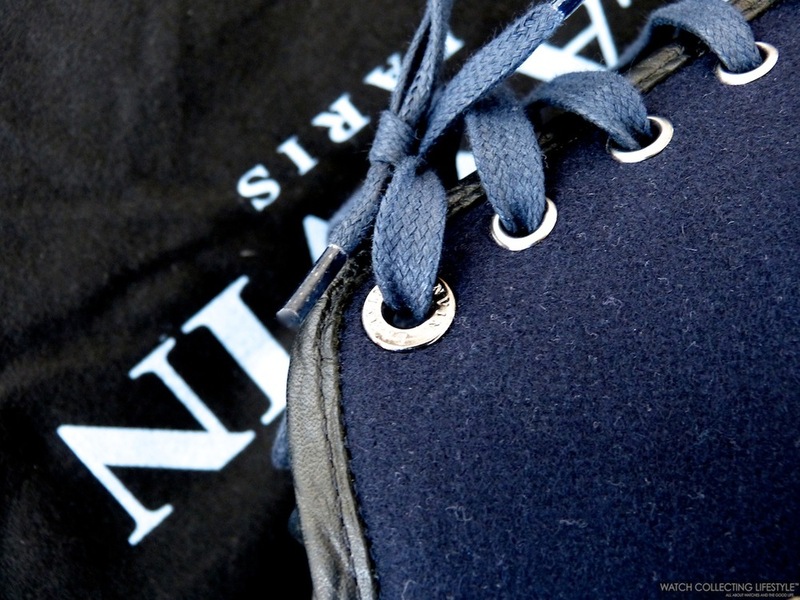 The shoes feature ventilation grommets around the arch area and perfect length shoe laces in blue. Opposed to the traditional full white soles on all other Lanvin Captoe sneakers, the felt model features white soles with a black inlay on the front, bottom and heel. This is a nice contrasting touch that sets this model apart from the others. If you are a true watchlifestyler and you are tired of wearing what everyone else has on, run over to Barneys, Bergdorf Goodman or the Lanvin boutique and get a pair of these amazing shoes that look as good with a pair of jeans or with a suit. We promise you won't regret it. Sticker Price $570 USD. For more info on Lanvin click here. 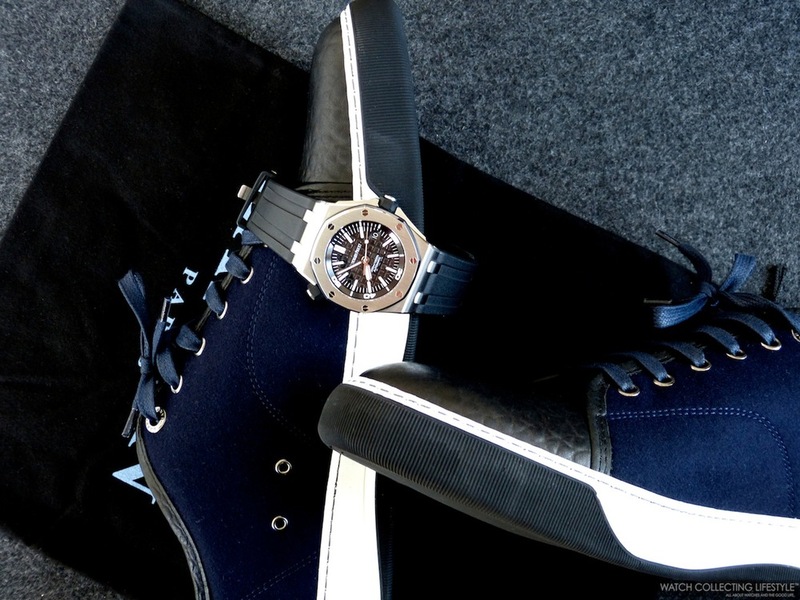 Posted on September 14, 2013 by Editor & Publisher and filed under Fashion & Style and tagged Lanvin Captoe Sneakers Lanvin Captoe Sneakers Felt and Leather Lanvin Sneakers in Blue and Black Audemars Piguet Royal Oak Offshore Diver ref. 15703ST.OO.A002CA.01 Lanvin Captoe Sneakers Felt and Grenade Leather Navy Blue and Black Jeanne Lanvin Chambre Syndicale de la Couture Chambre Syndicale de la Haute Couture Arpege Shaw-Lan Wang L'Oreal.